If the generosity of others makes it so, then in June, 15 more people will find the door to mobility and freedom through the auspices of His Helping Hands, Inc. 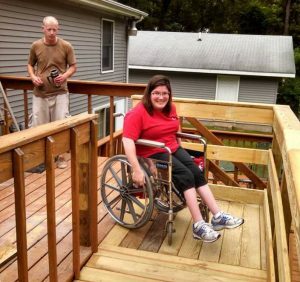 Founded in 2000 by Jeffrey Heft, His Helping Hands, Inc. is a non-profit organization that helps homeowners in need with handicapped accessibility and repairs. And, in some cases, also helps first-time homeowners with landing an affordable home. Since 2012, Heft has organized Ramps for Independence, a one-day building spree that provides multiple homeowners with ramps. Each year, Heft and volunteer groups have installed around 10 ramps on that day. On June 23, he aims to install 15 ramps. A friend, he said, had recently offered him the opportunity to learn carpentry and building skills. So, after a number of revelations through prayer, Heft buckled up his tool belt and began helping others through his new trade. Since then, Heft, with the help of many volunteers and donors, has installed at least 100 ramps on people’s homes. For the wheelchair-bound, whose independence is halted by a single set of stairs, it’s freeing. 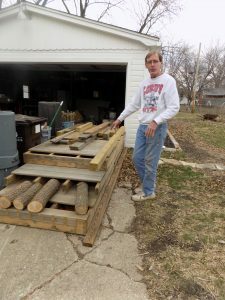 Each ramp costs around $1,000 in lumber and materials to build, which are provided at cost by LS Building Products in East Peoria. Labor is free, of course, thanks to volunteers. Heft is able to work on a project-by-project basis by leaning on donations and small grants from churches and local foundations. However, The Ramps for Independence project requires a pretty hefty lump sum. This year 15 people need a ramp, and Heft only has enough donations to cover three homes. Last year, the Peoria Area Association of Realtors donated funds for 10 homes, but this year, the organization has committed funds to another organization. Heft buys the lumber in May, so that it can be measured and pre-built in sections that are hauled to the house and assembled on site in June. This makes it easier for volunteers to install, and also makes it simpler to remove the ramp if it is no longer needed. In that case, the ramp is repurposed again elsewhere. Heft pairs with Advocates for Access, a local non-profit group that is managed “by and for people with disabilities.” AFA helps Heft’s group find applicants for the ramps, and currently 22 people are on the list. He hopes to find a way to help them all this year. The ramps are not about convenience, but about safety and often saving lives. “One very unfortunate situation, we were planning a ramp on the south side of Peoria, measured it, planned it, scheduled it. Then we got a call that the lady had a fire and she wasn’t able to get out of her house. That shouldn’t happen anywhere. Ramps aren’t very expensive,” he said. Donations may be made online at www.hishelpinghandsinc.org, or at their Facebook page, “His Helping Hands, Inc.” or by mail to 2527 W. Rohmann Ave., Peoria, Il, 61604. Heft may be reached by calling 309-256-1246.